Thought you guys might enjoy a sneak peek into things I’m working on plus art! This week, the topic of my project is the halo. Halo comes from the Latin halōs or nimbus, meaning cloud, round, circle, sun, and moon. While the Greek origination meant threshing floor. In modern language, it has evolved to interchangeably act as both a verb and a noun, meaning to surround, or to give an atmosphere of sanctity, alongside other various meteorological implications. As for art, the representations of halos seem endless in variety, from the solid metallic rings in medieval paintings to the more subtle implied halos formed by light in modern works. In exploring this topic, I’ve come to realize that halos are far more than the stereotypical golden ring that comes standard issue with harp. One can even go as far as to examine the ornate decorations of Buddhist mandalas for halo inspiration. Many divine beings are surrounded by a decorative accent, or halo, across the art of many cultures. And now the promised art! 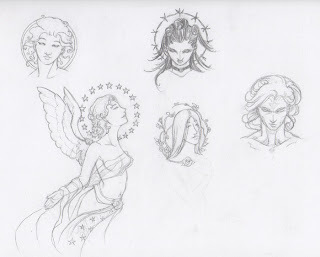 This first sketch is a combination of spot illustrations of various types of halos, from the implied to the pattern-inspired barbed wire one. The star halo you see was inspired by art nouveau, which was itself inspired similarly by religious imagery depicting the Lady of the Apocalypse, who was symbolized by the figure of Mary crowned by 12 stars. As you can see, the possibilities for halos are limited only by our imagination! Next is a little painting I’ll be working on to illustrate how to create a halo from radiating lines. She was really only meant to be a minor character illustrated for this purpose, but I’ve fallen in love with her attitude. Stay tuned for the next post where I’ll have a few more random factoids and painting progress to show! I hope you have enjoyed this interlude of artistic meandering. I find it funny that the scientific definition of ‘halo’ as a prefix stands for salt or sea. It really mixes up the mental images for a halo in a weird way! Just finished writing half of Chapter 1 of the semi-secret book project, now begins the illustrating! Working on entering more shows this year, including Mobicon, Dragoncon, and San Diego Comic Con. Cross your fingers for passing dcon jury! I may have a table this year, if all goes to plan. Trying to repress the project fairy so I can get work done! This weekend, I had the great pleasure of riding with Windfalcon to visit the birds of prey wildlife center at Georgia Southern University. Besides getting some wonderful reference shots of these graceful creatures, I found myself thinking on the meaning of wings. With angels on my mind lately for several projects I’m working on, I’ve been pondering the reason why so many artists and poets decided to meld these feathery appendages with the human form throughout the ages. What is it about the inclusion of wings that has marked these beings as divine? Perhaps the ability to fly , an unprecedented thing for early man, makes them boundless? Perhaps the untouchable beauty of watching a bird in flight inspired these artists to try and recapture that awe within the human figure? If ancient man was so fascinated by the impossible prospect of flight that they reflected this need upon angels, why, then, does modern man still find it so fascinating? We have long been capable of flight thanks to the Wright brothers, and yet, most angels are still drawn with wings. What might an angel look like in modern imagery if we try to reflect what we are incapable of achieving in the depiction of their form, just as ancient man did in adding wings? Instead of a fiery sword, would an archangel carry an AK-47? A dragonscale bulletproof bodysuit over a set of Roman plate mail? These days, instead of wings, most angels in modern movies and books seem to wear long black trench coats and sashay dramatically with long, gorgeous locks of hair. Even more, these seemingly pure creatures have become sensual and human in a way that has added an edgy fascination for many. Whatever the reason, I can personally see why early man might have chosen to give a human the grace of a bird, just from peeking into that world of birds of prey and watching these lightweight hunters float soundlessly on the air, or fly so fast they barely leave an imprint in my vision. Birds really are wondrous creatures…a pity we mainly ignore them because we’re simply too used to them being around us. I suppose we should thank/blame Windfalcon for this post. She bit me with her bird fever. If anyone’s interested, I’ll be posting up some of the reference footage I shot while at the raptor center at my YouTube page sometime soon once I get permission to do so. 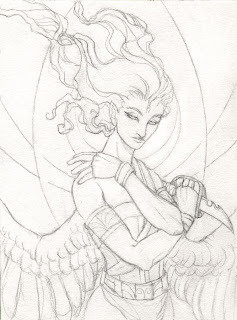 Until next post, enjoy this contemporary take on a classical archangel. After so many serious business posts, I thought I might air out this journal with a glimpse into a walkthrough I’ve been working on lately to stretch my legs at writing instructional art direction. The first blossoms of Spring have sprung and everywhere the Forsythia have blossomed in bunches of yellow splendor. This awakening of color has inspired my latest little miniature piece, Forsythia. Why I chose to make such a detailed piece a mini, I’ll never know. 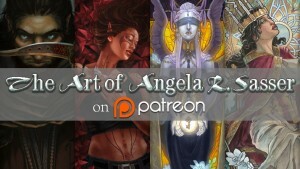 I’ve found a good deal of inspiration as well in reading Angels: Celestial Spirits in Legend and Art by Jacqueline Carey which has brought my eye back to such old forgotten favorites as Botticelli and Weyden, among others. There are so many angels with bright multi-colored wings, gleaming peacock eyes, and other peculiar details that I never would have noticed if I hadn’t come back to these artists with a new perspective. The ol tried and true formula of the angel with white wings and a ring halo is definitely one I’m seeking to break. Without further ado, here’s an excerpt of the first few steps of my latest work. You can view the entire walkthrough as it happens here. I’m currently about to begin the watercoloring phase. Are my instructions easy to understand? Do you have any suggestions for how I might improve? Let me know! These tutorials are for you. I want to know what you want.